L Shape Bunk. Can be placed in any way as Ladder is movable. Has one Guard Rail on Bottom an Two Guard Rails on Top. Come with a Vin Bookcase. 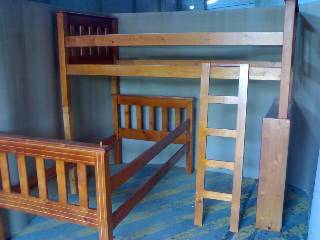 Solid Wood Pine Double Bunk – Require assembly. Fits under most beds.Great for unexpected Guest. Hides away.